The Erne County boss also opens up on his lingering frustration over the Aidan O’Shea penalty incident. Ulster and Fermanagh football manager Pete McGrath. 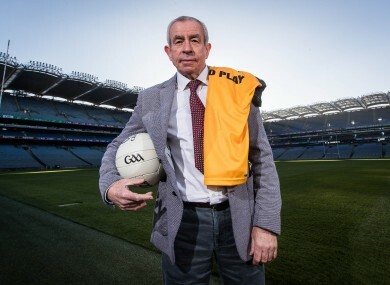 PETE McGRATH IS used to proving people wrong on the pitch. So when he stares you in the eye and insists Fermanagh have the personnel to win a first Ulster senior football championship, you’d be foolish not to listen. The Erne County haven’t been in a provincial decider since 2008 but they have been showing signs of bridging the gap in recent seasons under McGrath’s seasoned stewardship. It’s been a tough few years for Fermanagh; their last Ulster championship victory against a side other than Antrim came against Cavan in 2010. But McGrath, who guided Fermanagh to the All-Ireland quarter-finals in 2015, where they lost to eventual All-Ireland champions Dublin by eight points, is forecasting a breakthrough season in 2017. After consolidating their position in Division 2 of the league this year, following their promotion from Division 3 in 2015, confidence is growing in McGrath’s setup. A seven-point loss in their Ulster quarter-final with Donegal and a controversial five-point qualifier defeat to eventual All-Ireland finalists Mayo eventually put paid to this year’s championship campaign. But the two-time All-Ireland winning manager is certain Fermanagh will be much stronger on the back of such a tough campaign, and now he feels the county’s first Anglo-Celt Cup is within reach. “I’m convinced they can do it (win a first Ulster title), absolutely convinced,” McGrath, the Ulster manager for this weekend’s Interprovincial Championship in Parnell Park, said. But with a preliminary round tie against Monaghan looming as Fermanagh’s Ulster opener, McGrath concedes his panel will need to go to a whole new level in 2017. “We’ve now hit that major challenge, getting them from there up to here through hard work and organisation. “They are a good squad … but getting them up now to where they can actually take a big scalp [is the challenge]. “Monaghan in the first round of the championship, that’s the real litmus test at this stage. I know the quality is there. We’ve been building and I think the experience of big matches last year will help. That’s what I keep telling the players. “If you’re 23 or 27 or 28, playing for Fermanagh, and you could be on the first team ever to win an Ulster championship sure that would drive you to any kind of lengths … to be part of a history-making team. “It’s within their reach, they can do it. There was uproar in Fermanagh after the Mayo defeat; Aidan O’Shea went down easily under the challenge of Che Cullen and a penalty was awarded to the Connacht giants. Before the complaints had abated the Ulster side’s one-point lead had been wiped out by Cillian O’Connor’s right boot and they found themselves two points in arrears. Fermanagh’s championship ended that July afternoon in Castlebar, Mayo’s, meanwhile, continued into October. The incident still rankles with McGrath. “It’s been well documented since that it should never have been a penalty, we all know that, that’s established. “My argument then and my contention still would be that if they hadn’t got the penalty, we were leading by a point at the time with seven minutes to go, I’m not saying we would have won but the match would have gone down to the wire and anything could have happened. “The penalty took away that opportunity for us to push them right to the wire. McGrath may radiate positivity when it comes to Fermanagh’s prospects, but when it comes to the build-up to Ulster’s semi-final tie with Munster (4pm) on Saturday he admits it hasn’t been plain sailing. Star names such as Sean Cavanagh of Tyrone, Donegal’s Michael Murphy and Monaghan ace Conor McManus are unavailable for a variety for reasons. “Michael Murphy is taking a complete break from football for the moment, Conor McManus needs this time of year for rehab and that type of thing. The two Cavanaghs, Sean and Colm, are on holiday that weekend. There’s no doubt that a number of GAA players take holidays in December because it’s one of the few times they’re sure of not missing out on anything. McGrath had hoped to have the likes of Sean Quigley (groin), Barry Mulrone (knee) and Ruairi Corrigan (shoulder) from the Fermanagh panel available this weekend but all three will miss out through serious injuries, although he expects them to be available for the start of the national league in February. “Sometimes when you’re contacting players from other counties and you see they’re getting rehab done you might be sceptical but I’m not because I know what’s happening in my own county,” McGrath explains. Email “McGrath 'absolutely convinced' Fermanagh are ready to win first Ulster title”. Feedback on “McGrath 'absolutely convinced' Fermanagh are ready to win first Ulster title”.